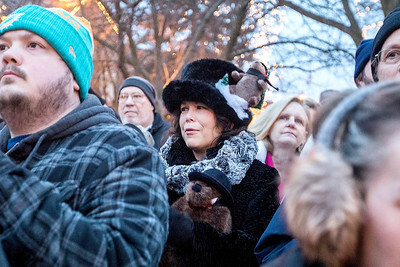 Sarah Nader- snader@shawmedia.com Woodstock Mayor Brian Sager listens to what Woodstock Willie has to say on Groundhog Day on the Woodstock Square Tuesday, February 2, 2016. Willie did not see his shadow, meaning we're in for an early spring. 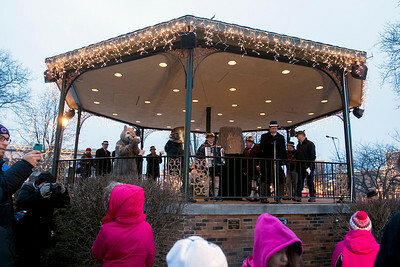 Sarah Nader- snader@shawmedia.com Woodstock Willie is presented to the large crowd that gathered Tuesday morning on the Woodstock Square for the annual Groundhog Day Prognostication February 2, 2016. Willie did not see his shadow, meaning we're in for an early spring. 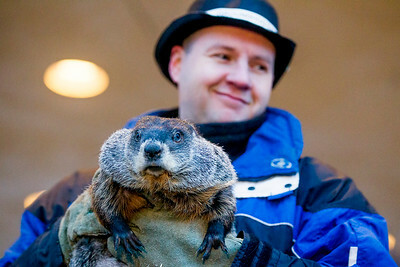 Sarah Nader- snader@shawmedia.com Handler Mark Szaran of Chicago shows the crowd Woodstock Willie during the Groundhog Day Prognostication Tuesday, February 2, 2016 on the Woodstock Square. Willie did not see his shadow, meaning we're in for an early spring. 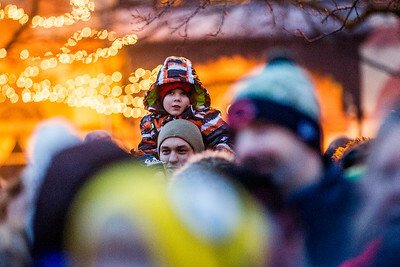 Sarah Nader- snader@shawmedia.com A crowd gathered on the Woodstock Square Tuesday morning for the Groundhog Day Prognostication February 2, 2015. 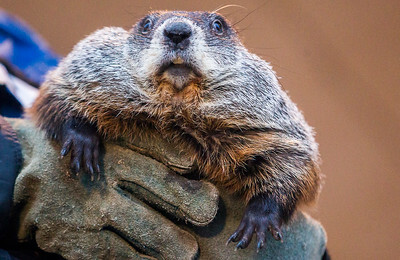 Woodstock Willie did not see his shadow, meaning we're in for an early spring. 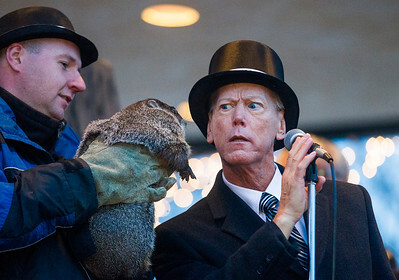 Sarah Nader- snader@shawmedia.com Woodstock Mayor Brian Sager listens to what Woodstock Willie has to say as his handler Mark Szaran of Chicago holds him on Groundhog Day in the Woodstock Square Tuesday, February 2, 2016. Willie did not see his shadow, meaning we're in for an early spring. 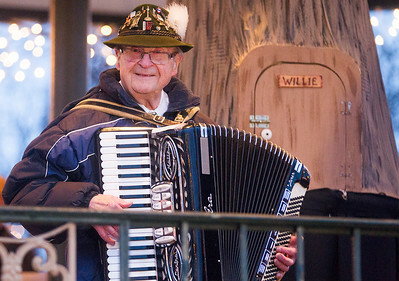 Sarah Nader- snader@shawmedia.com Frank Jay of Belvidere plays for the crowd that gathered on the Woodstock Square Tuesday morning for the Groundhog Day Prognostication February 2, 2015. Woodstock Willie did not see his shadow, meaning we're in for an early spring. 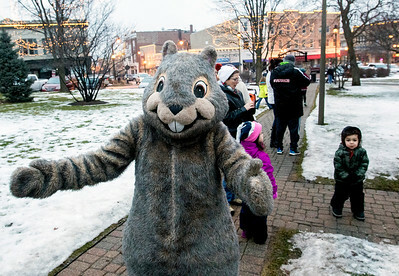 Sarah Nader- snader@shawmedia.com Woodstock Willie greets the crowd that gathered on the Woodstock Square Tuesday morning for the Groundhog Day Prognostication February 2, 2015. Woodstock Willie did not see his shadow, meaning we're in for an early spring. Sarah Nader- snader@shawmedia.com Suzanne Leclair (center) of Woodstock holds a stuffed groundhog while on the Woodstock Square Tuesday morning for the Groundhog Day Prognostication February 2, 2015. Woodstock Willie did not see his shadow, meaning we're in for an early spring. 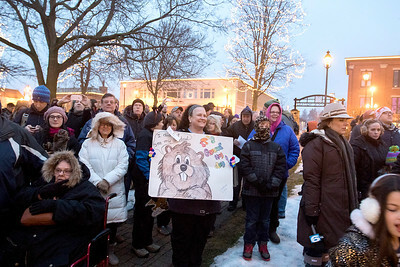 Sarah Nader- snader@shawmedia.com A crowd gathers on the Woodstock Square Tuesday morning for the Groundhog Day Prognostication February 2, 2015. Woodstock Willie did not see his shadow, meaning we're in for an early spring. 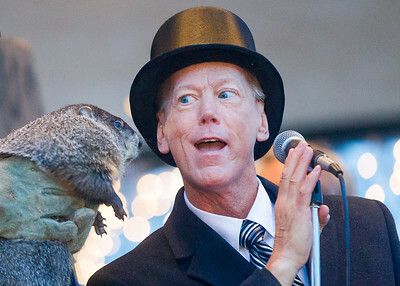 Handler Mark Szaran of Chicago shows the crowd Woodstock Willie during the Groundhog Day Prognostication Tuesday, February 2, 2016 on the Woodstock Square. Willie did not see his shadow, meaning we're in for an early spring.